Garment Designer Testimonials on Cochenille’s pattern making sewn and knit garments. I sought out Garment Designer because I wanted to adapt ready to wear designs for personal use and design knitting and sewing patterns that could be marketed. I am 3 sizes different between top and bottom so altering patterns is a chore without it. I also have a collection of vintage patterns that can be measured up and resized for use. I felt Garment Designer was a good choice due to the ease of use and full feature options for printing, sizing and grading plus knitting cheat sheets. Now I see pattern and fashion possibilities in a whole new way, especially after the lesson CD and webinars on copying ready to wear and body 8-head proportions. I can walk into any dressing room and in less than 5 minutes walk out with a dimensioned drawable schematic in my head, and sit in the mall watching fashions go by front to back and sketch out ideas I want to keep complete with proportion, starting dimensions and estimated working ease before the person is out of sight. What I like best about the software are the style sets!!! And the overall intuitive ease of use. Watch the demos online on the Cochenille website and then attend an online webinar or two to get a feel for it’s versatility and the ways it can be used. Maybe hold a drawing door prize at the introductory presentations of Cochenille to prospective buyers who don’t have it yet that offers one free webinar and if the person doesn’t think they will use it, draw another name. Include a permission choice on the entry drawing tickets to opt in for participation in your email list mailings. That way they can try before they buy from afar and test out what it would be like to be a participant without any commitment or $$$ or time pressure. As knitwear artisan I needed to make patterns other than with pencil and paper and knit leaders. I met Susan at the Creative Sewing Festival in Toronto and bought Garment Styler from the Toronto Rep….but never used it, I found it restricting. When I saw Susan at the next show with upcoming Garment Designer with ‘click and drag’ I was very excited. I got it then (in the ’90’s sometime) and have loved it ever since! Great for making my custom orders. The Click and Drag option greatly exited me and allowed for any design I wanted to execute and to make minute adjustments. It is a great outlet for my creativity and I have a file full of ‘Custom’ patterns as well as ‘Stock Wool’ and Stock Cotton’. I never quite got into Stitch Painter but it has come in handy for designing motifs when I have needed it. With Garment Designer I can take a pattern I already have and tweak and resize it for a client or new design. If a pattern already works I start from there. I love being able to resize what I see onscreen while working, and then printing out at 1/6th size so I can get the schematic and instructions for one piece on one page. I also love being able to write notes in the User notes panels. I also override the Auto Date as I want to know the date I created the style or pattern either for my stock or for the client. I have shown people what I have accomplished with the software. I would point out that I went to Cochenille initially because it was the only one for Macs and was waaaay cheaper than Design A Knit (DAK) which I still don’t ‘get’. I find it intuitive but with so much to work with. I have run through the basic creating of a sweater with GD and show them my first effort which I still wear. I also throw in that it is a small personal company and that it was founded by a Canadian! For the past nineteen years I have costumed anywhere from 900 to 1,200 bodies every year for the show – The Royal Nova Scotia International Tattoo. As I have limited time to do this job and get it on the floor – many times performers arrive only days before the performance – I was looking for something to save me time in drafting all the patterns. I found Cochenille – Garment Designer. I found the program easy to use and the staff very helpful. I have from time to time attended the webinars just to refresh. I bought garment designer on the recommendation of a friend. I like it but have to requests: 1/ I’d like to be able to add dots. I often break my side seams, straight for the border, sloped for the side seam, and an nigh or two straight under the arm 2/ on slopes, the number of decreases changes, rather than a logical progression; often I rewrite that. However I would and do recommend it to friends. 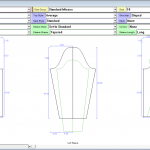 I purchased Garment Designer because I had gained weight and was no longer one pattern size. The idea of creating a pattern that fit me, was just too good to pass up. I use the basic patterns I made with the program all the time. If I happen to like a design in a commercial pattern…I still use my garment designer created pattern as the base. I still have to make some adjustments here and there dependent on the style or fabric I have chosen. I also use the GD in my knitting. I use the schematics from a pattern I like in one of the knitting magazines, use my own sloper to be sure it fits, make a swatch with the yarn I have and enter the gauge . I was introduced to GD at one of the sewing shows. The demonstration of the software convinced me that it was exactly what I needed. The clothes I make fit better..and I am knitting more. I like having the ability to create my own pattern. I would tell them to purchase the software but to understand that it takes some work in the beginning . I was looking for affordable & Mac compatible software to help get me started with my small businesses. It’s affordable, multiple uses and easy to learn. I opened a business! It’s still part-time, but growing. It offers sizing, lots of templates. It’s a good price and not going to break the bank, and you can work your way up to “pro” software down the road if you need to. Perfect for home sewers & knitters.